This tender and flaky fish deserves the perfect pairing. With it’s light yet complex flavors, our Maui Original Sauce is the perfect partner. This meal will a very healthy alternative when on the go. Move salmon steaks into a large sealable freezer bag and pour a half jar of Azeka’s Hawaiian Sauce and generously coat each steak. Reserve the rest of the jar for basting. Squeeze out remaining air, seal the bag, and move to the refrigerator. Allow salmon to marinate for 1-2 hours for best results. Drain and discard used sauce. Begin to steam assorted veggies and make rice to desired doneness. Pre-heat grill to medium heat. Place salmon on the preheated grill and baste with fresh sauce. Cook salmon for 6-8 minutes per side, until the fish flakes easily with a fork. Optional Cooking – Set oven rack about 4-inches from the broiler and preheat broiler for a few minutes. Place Salmon Steaks onto a broiler pan and broil on medium-high for 5-7 minutes. Carefully remove, brush Salmon Steaks with fresh reserve Azeka’s Hawaiian Sauce, turn Salmon Steaks over, and broil until fish flakes easily, about 5 more minutes. 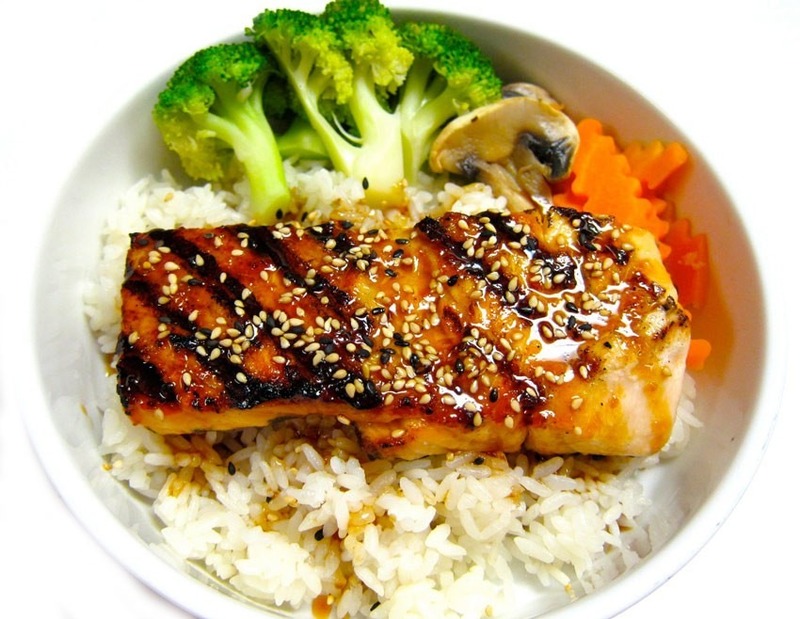 Once Salmon is cooked, top with seseame seeds and serve with side of rice and veggies. If desired, top with more fresh Azeka’s Hawaiian Sauce. Tips: Never reuse sauce that has touched raw ingredients, such as fish. When grilling, be sure to watch the flames because excess flames will char the salmon.